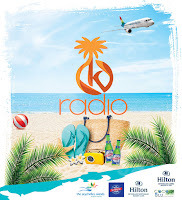 The launch of the radio competition took place on Friday 14th September 2018 at the Hilton Labriz Lounge Jetty at Bel Ombre. The cocktail event hosted by the Hilton Hotels saw the participation of all corporate partners to the project that is Hilton Seychelles Labriz Resort & Spa, Hilton Seychelles Northolme Resort & Spa, Air Seychelles, Seychelles Breweries, CocoBlu Restaurant, and the Seychelles Tourism Board (STB). Mrs Sherin Francis, STB Chief Executive expressed her satisfaction for STB to be collaborating with K-radio on this initiative, “STB did not have a minute of hesitation with assisting on the #ilovekradioSeychelles project. It is a great initiative as it gets more people abroad to listen to K-Radio, which indirectly gives more visibility to the destination, “Said Mrs. Francis.